A little about VIPCars - Who we are! An international car rental broker and a brand that has been offering cheapest car rental booking services since 2010, VIP Cars takes pride in its 1 Million+ happy customer base, a trusted circle of rental brands, low-priced car rental deals & ease of booking. From top International names like HertzAlamoDollarSixtAvis to the most trusted domestic rental companies, we work in unison with a network of 500+ car rental suppliers all over the globe. Advantages of booking with VIP Cars : What makes us 'go-to' brand? 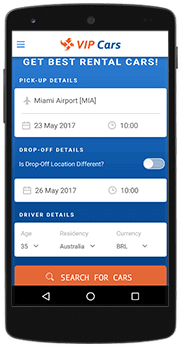 As one of the leading and most trusted car rental booking platforms, we present a user-friendly booking form that has everything a customer needs to book a rental, no matter the date or location. From swift pre-bookings, cost-free cancellations to hassle-free booking modifications & management, VIP Cars is the perfect place to find a rental car, compare deals from best car rental companies & reserve the car through a secure transaction process. At VIP Cars, we totally believe renting a car should be a quick process and with a round the clock support team accessible via email, live chat and dedicated telephone numbers for different countries, we are on toes for any question, query and even to book a car on your behalf. So many services, features and renting advantages yet a simple booking process. “VIP Cars is basically Quality with Simplicity!” In just 3 simple steps you get to reserve your car for your destination, through your preferred rental company. Step 1Just fill the form! As soon as you fill your pickup & drop off destination along with the preferred date, time & age, you are ready to be taken to a wide selection of rental cars to select the one meant for you. Step 2Just Compare & Pick! Picking a car from so many options for one location can be fun or a hassle, depending upon the customer. Our filters on the search page are designed to make these searches simple & swift. You can either browse through all given options or just cut to the chase by selecting your car type, price range or supplier preference. Each rental comes with detailed information on the inclusions covered, supplier ratings & pick-up location etc. Step 3Just Pay & Book! As soon as you are done comparing & selecting the car that fits your rental needs, all that's left is to make the payment. Once you make the payment to reserve your car, a confirmation email is sent to you with details of your booking. VIP Cars is closely connected with its suppliers, customers & affiliates to provide the best in the industry! Our network of 500+ suppliers comprises of International & Domestic companies. Associated with us for the best ‘Return On Investment’ are a huge number of contended affiliates. Mobile APP for any time, anywhere booking! You can’t expect us to claim the title of ‘Best’ without covering the simplest yet a very important convenience factor - Mobile App. Easy-to-use App for both AndroidTM and iOS. Reserve a car anytime, anywhere. Track history & manage bookings. Enjoy best car rental deals at your fingertips with our ‘On the Go’ Bookings from biggest brands.